My copy of Edouard Manet's "In the Conservatory" based on a post card and the leaflet of the exhibition mentioned in the main text. The lady in the copy looks younger than that in the original, and I like the former more, though it is, needless to say, artistically much inferior to the latter. Last Friday the final road repairs after drainage works was going on in front of my house. My wife and I could not bear the noise of repair works and the smell of tar. We just had two tickets of the exhibition "Masterpieces of the Museum Island, Berlin: Visions of the Divine in the Sanctuary of Art" being held at Kobe City Museum. So, we went to see the exihibition. The exhibition is one of the highlight cultural events of the "Germany in Japan 2005/2006" celebrations. The Museum Island (Museumsinsel) is a complex of buildings composed of individual museums located in the heart of Berlin, and was designated as a World Heritage site in 1999 . The complex consists of five museum buildings: Altes Museum, Neues Museum, Altenationalgalerie, Bode Museum and the Pergamon Museum. The reconstruction of the complex is in progress to be completed in 2015. The exhibition shows approximately 150 select artworks, many of which have come for the first time out of Germany, to convey the essence of the cultural landmark's future image. We can see works from prehistoric and ancient ages to the modern era. I especially liked "Altar Relief: Sun God Aten and Akhenaten's Family (New Kingdom, Dynasty 18, Amarna Period, ca. 1345 BC)," "Head of Cleopatra VII (ca. 40 BC)," "Venus (Sandro Botticelli, ca. 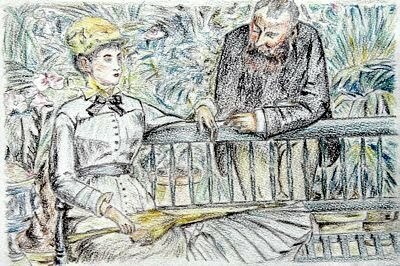 1485)" and "In the Conservatory (Edouard Manet, 1878-1879)" to name a few. In front of "Head of Cleopatra VII" I remembered Blaise Pascal's words I had learned in a French grammar course of a university: "Si le nez de Cléopâtre avait été plus court, toute la face de la terre eût été changée. (If Cleopatra's nose had been shorter, all the surface of the earth would have been different.)" Museumsinsel (Museum Island), Berlin (UNESCO World Heritage Web site).